Merci, mes amis! 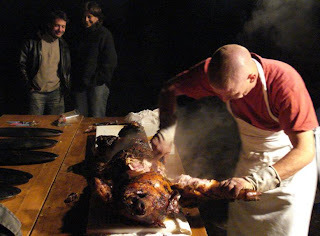 In my last blog, I was complaining (that’s too strong an expression, as I love our life here) of having too much to do and it’s exactly at times like these when one needs willing friends. 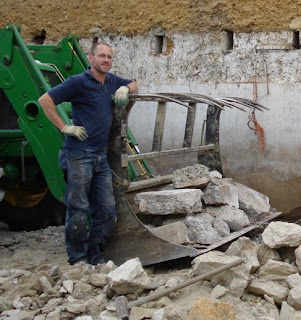 I’ve previously told you (22nd April) about the mutually beneficial arrangement with our new neighbour Philippe to remove his pigsty in exchange for me keeping all the stone for our proposed straw-bale house. It’s only when I started taking the thing to pieces (with Philippe’s and his son Tanguy’s help) that I realised the enormity of the task; clever ideas backed up with self-confidence and enthusiasm can be a real drag at times! 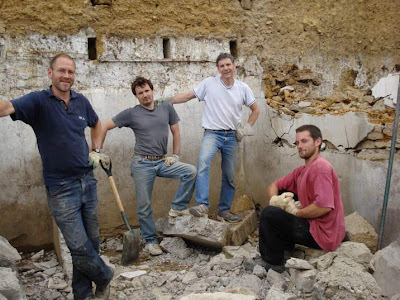 9am, Saturday morning and (in the photo, I’m first left, then) Christophe, Jean-Luc and Samuel arrive to share croissants and coffee before a full day’s pigsty dismantling. Another big thank you is due to Paul, our pig-farming neighbour, who trusted me with his huge John Deere tractor with a bucket on the front to manoeuvre the stone just over the road to our building plot. It was an exhausting, yet happy day, with lots of laughs, and I have many fond memories, including, on more than one occasion, looking out of the cab to see Christophe on the left waving the bucket downwards and Samuel on the right simultaneously indicating that I should raise the bucket. Normally, the French work the mornings and afternoons without a break, which they more than make up with by spending anything up to two hours devouring a four-course lunch with wine and coffee. An English workman, in contrast, will enjoy tea breaks but probably spend a 40-minute lunch break eating sandwiches in the cab of his van whilst reading a newspaper. I’m all for cultural integration, so we had both. I’m hoping to arrive at the perfect European working day by also including the Spanish after-lunch siesta! The main course was the rabbit I shot at Christophe’s house (see last blog) and, whilst everyone else got tucked into the tender, tasty meat expertly cooked by Gabrielle in a cider and mustard sauce, Christophe toyed with his, with markedly less enthusiasm, perhaps confused by the memory of cute bunnikins romping around his garden eating all his expensive shrubs. All our normal jobs also needed attending to and so we were grateful for Camille’s help (5 year-old daughter of our neighbours Celine and Michel) in herding the geese from field to their house in the evening. A quick beer together at the end of the working day and return Paul’s tractor then straight in the shower to get ready to go out in the evening to a pig roast to the benefit of some young local lad who’s apparently the go-cart champion of Brittany; I hope he remembers our generous sponsorship when he becomes an unfeasibly rich Formula One driver! Photo shows a scrubbed up and relaxed Christophe sharing a joke with Gaëlle.